Documenting the Roman frescoes in the Imperial Cult Chamber at Luxor temple is a rather unique Epigraphic Survey project. A few years ago, these frescoes went through a very thorough restoration process, including extensive photo documentation. The results of this preliminary work are being published now by the American Research Center in Egypt. When the decision was made to undertake a more in-depth recording of these frescoes, there was a long debate about which aspects of the fresco should be emphasized on a drawing and how to differentiate its rather distinctive style from the Pharaonic scenes behind it. 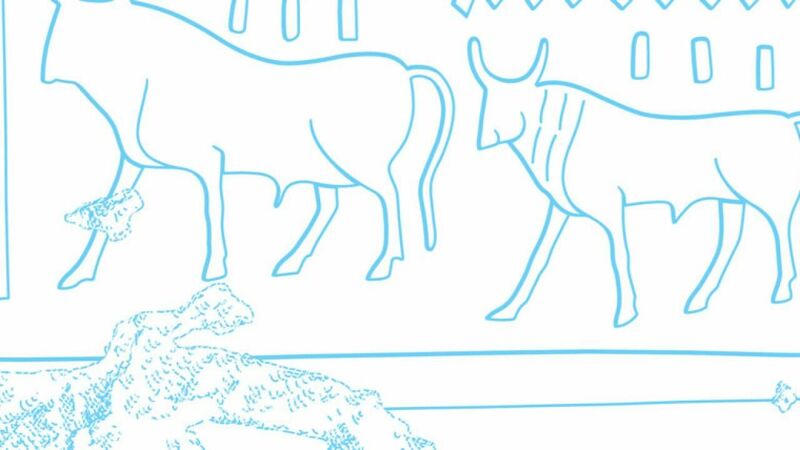 The solution was to design a method that shows a wide range of (mostly) eroded painted details, at the same time keeping the simplified graphic language that the Epigraphic Survey invented for relief documentation. Once again, the goal was not to replace the already-produced color photos, but to complement them with drawings showing synthesized and enhanced details of the paintings. 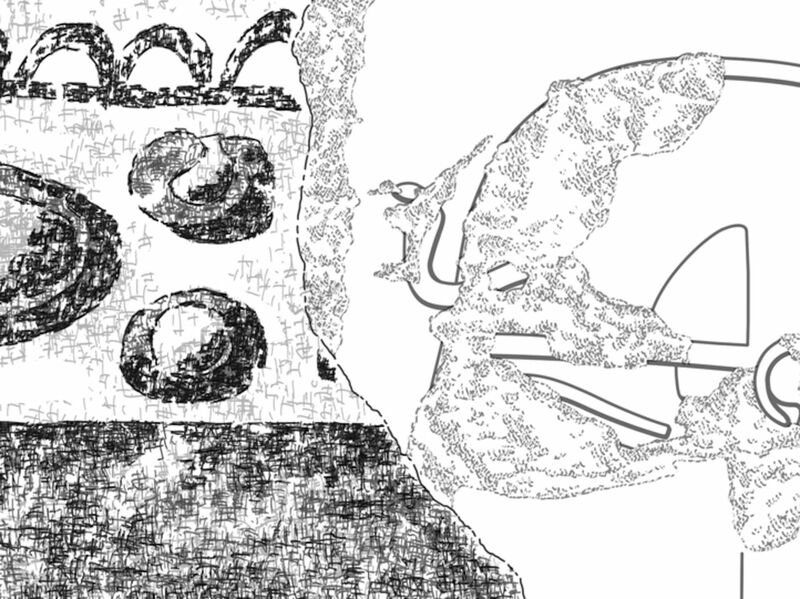 The in-situ drawing was created by using pencil lines on a photo enlargement. 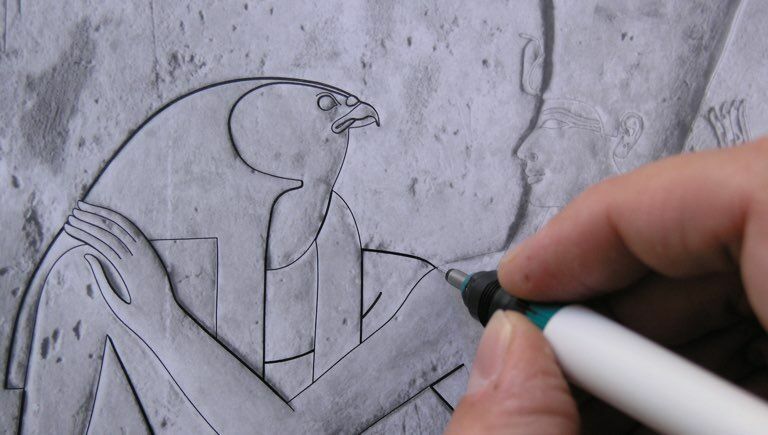 The underlying Eighteenth Dynasty relief decoration, visible in areas where the fresco had fallen away, was treated using the traditional Epigraphic Survey conventions, while the fresco was penciled using a crisscrossed pencil pattern instead of outlines. 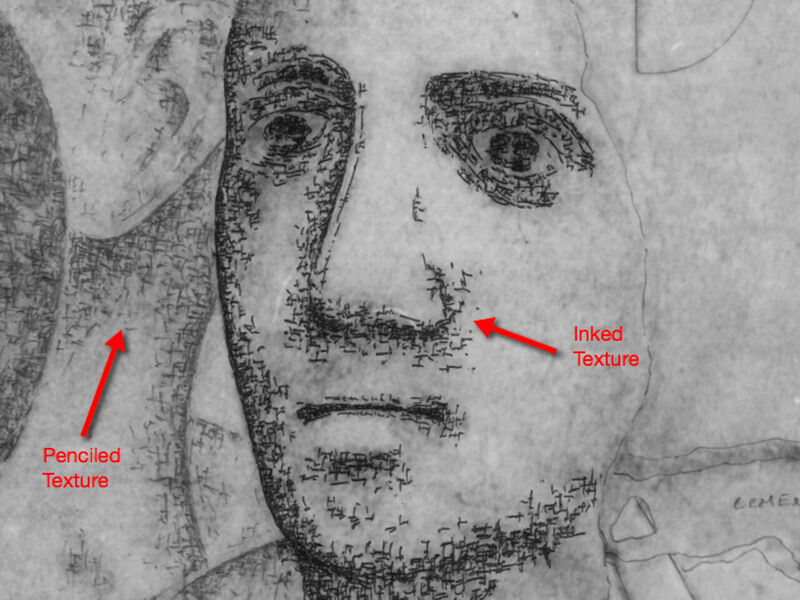 This method allowed the artist to indicate such subtle areas as eroded surfaces where very little pigment was left and regular pencil lines couldn’t be used. 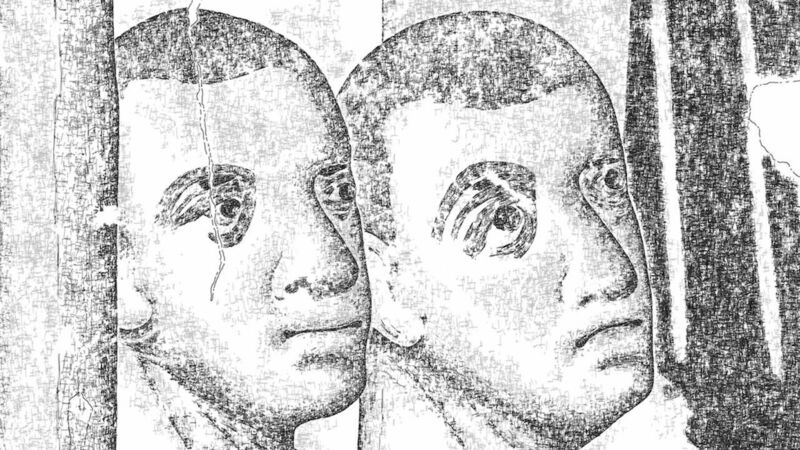 In most cases the observer’s eyes piece these patterns together into distinct features. 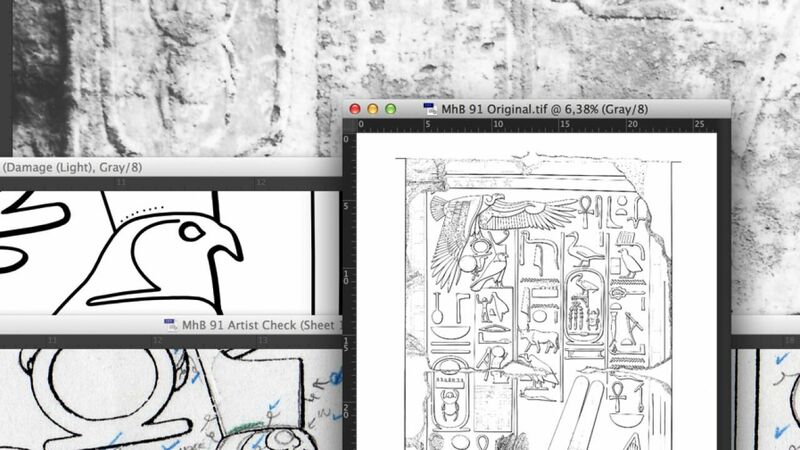 Scanning was executed in stages to be able to separate the penciling from the background photo (we’ve written about this in detail in Chapter 4, Section 3). 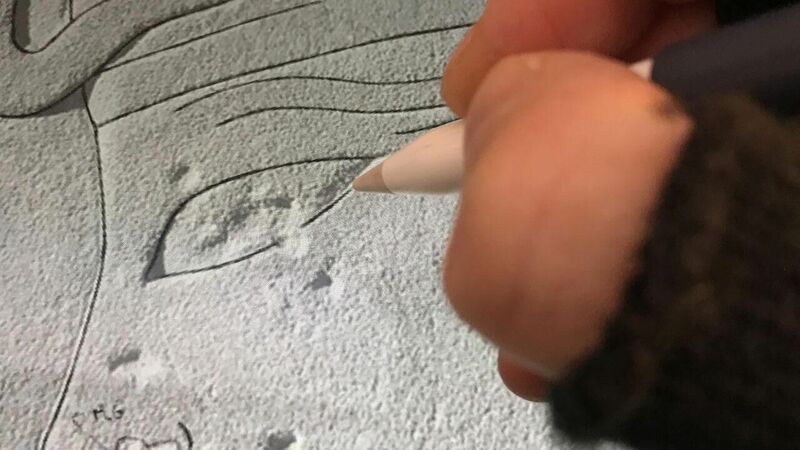 The first attempt was to recreate the fresco pattern digitally, which required a thorough copy of the in-situ pencil crisscrosses throughout the entire drawing. Later on, another layer was added on top of the first, containing much less texture but a lot more depth and definition. To distinguish between layers and to get the desired effect, different opacity effects were added to each layer. Changing the Layer Opacity instead of setting up different brushes allowed the artist to work with the same brush sets on every layer. 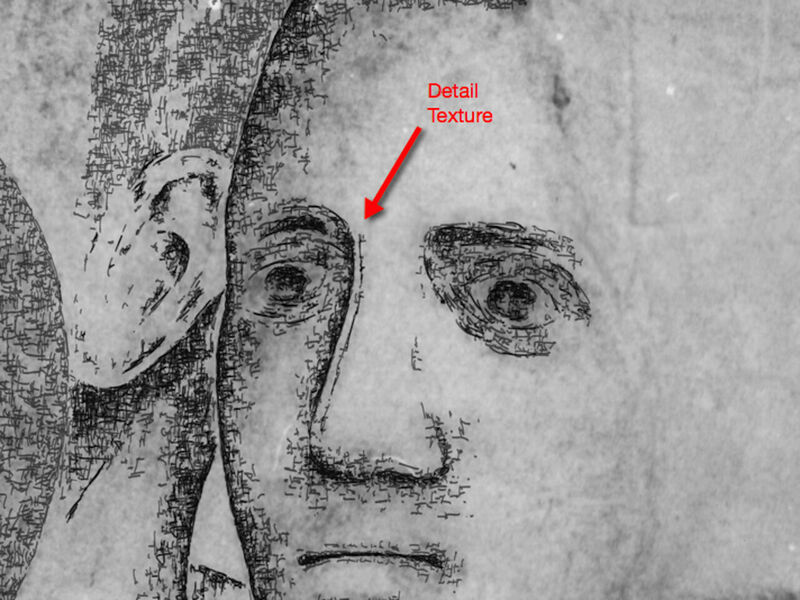 In the next step, a lighter texture was added on yet another layer, indicating subtle enhancements for capturing details. 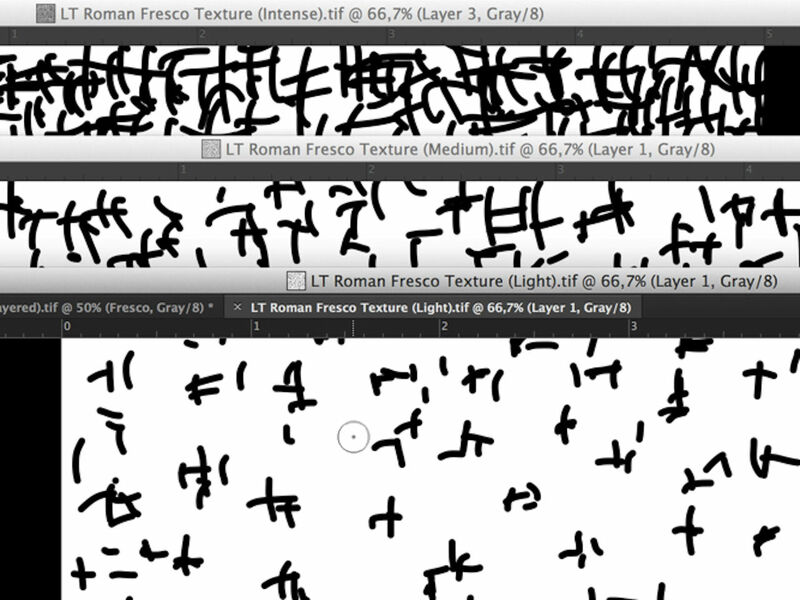 At this point, all three layers were based on the same black brush line texture, with the opacity being 30-60-80%, respectively. 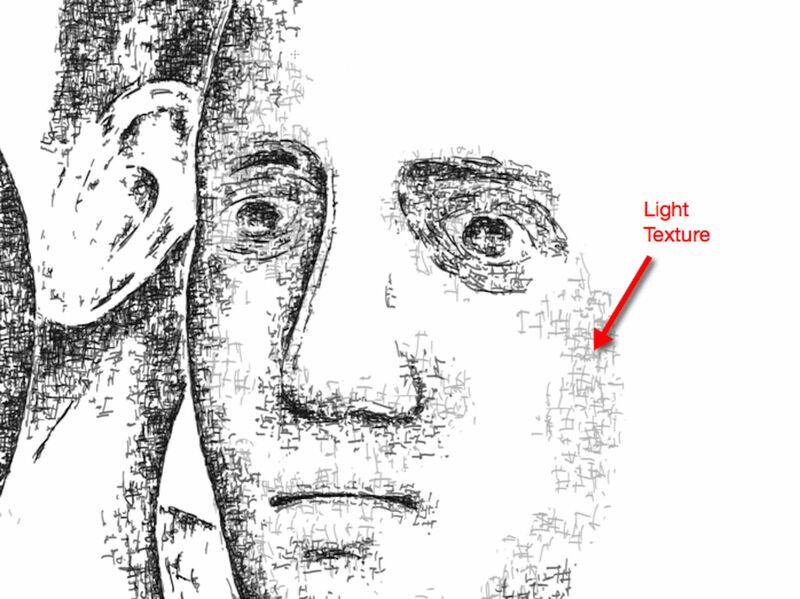 When adding texture to large homogeneous areas (draperies, background, etc.) a pattern of crisscrossed lines in different densities was used to speed up the process. 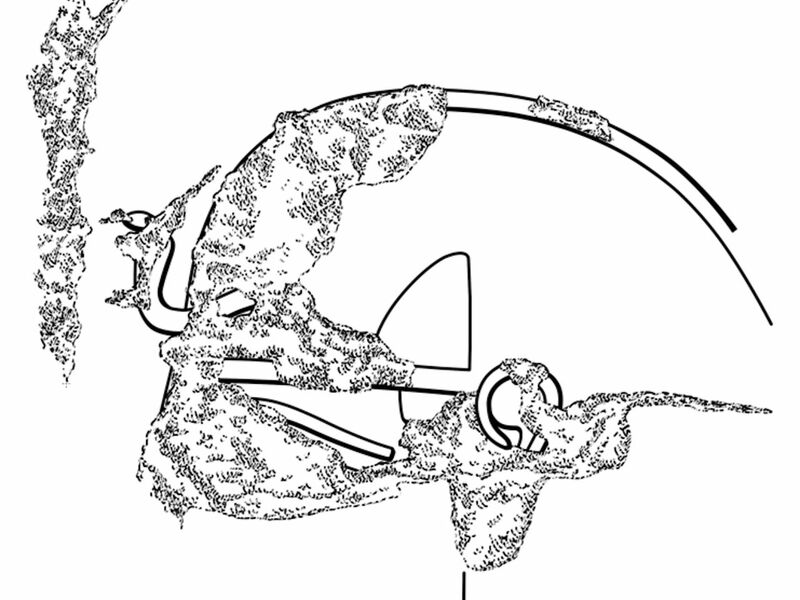 The same Pattern Stamp tool was used for adding lighter detail textures as well. 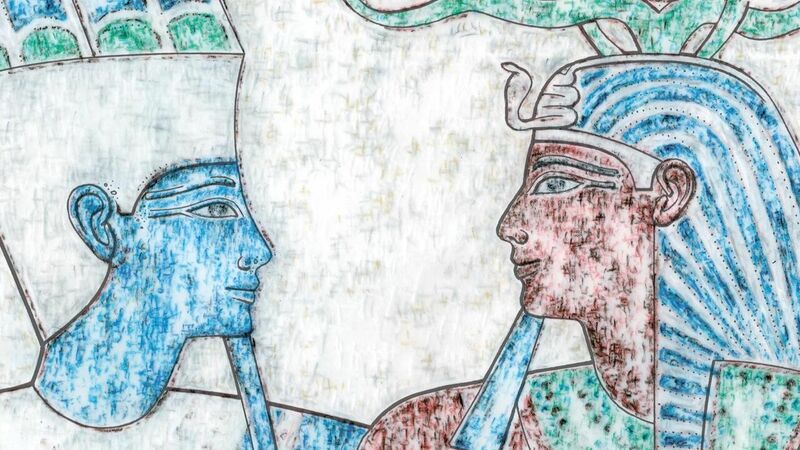 While no damaged areas or any other nondecorative surface elements were added to the fresco to avoid overcomplicating its appearance, the Pharaonic layers were treated in the opposite way. The result was a richly textured fresco drawing with only damage outlines included, juxtaposed with a much more simply outlined relief representation, including rich textured damage surfaces. For presentation purposes, the Pharaonic layers had to stay in the background, so the oppacity of all these layers was taken down to 50%. This change gave the layers a very similar appearance to the actual situation on the wall. Consequently, many different versions can be printed based on the opacity of each layer, depending on what features need to be emphasized. Dear Jeremy, thank you very much for taking an interest in our website! 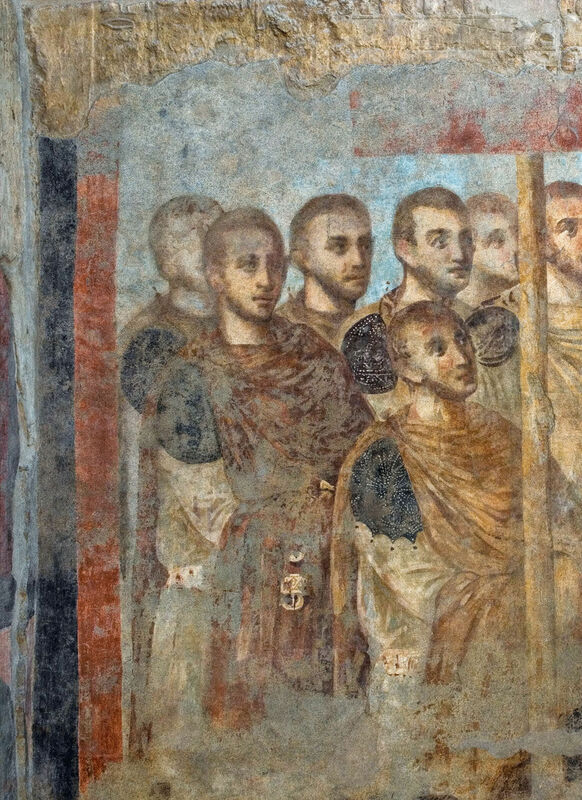 Regarding the late roman murals and who they represent, we believe, that the figures appearing on the South-East wall are well-dressed dignitaries paying homage to one of the enthroned tetrarchs. Indeed, the individuals in the top row wear red-ocher cloaks signaling their high office (paludamenta) fastened at their right shoulders with fibulae. You can find a detailed description of the frescoes in the following book: Susanna McFadden and Michael Jones (eds.) - Art of Empire, The Roman Frescoes ad the Cult Chamber in Luxor Temple (2015).